Blood tests are used to diagnose allergies and to monitor the effectiveness of immunotherapy, which is used to prevent allergies. They are particularly useful if the allergy skin tests, which are the preferred allergy testing method by most specialists, cannot be performed. Read on to learn everything you need to know about allergy blood tests. How Do Allergy Blood Tests Work? Allergy blood tests are used to measure the levels of allergen-specific antibodies in the blood, particularly immunoglobulin E (IgE). An increased production of these antibodies is a part of a normal defense mechanism of the immune system, when it detects an allergen, which is a foreign substance in our body perceived as a threat. Allergy blood tests check for antibodies to the most common allergens, such as egg white, dog's dander, or latex. They are often performed as allergy panels, which means the allergens are group based on their type. For instance, a food panel contains only food-related allergens, whereas an environmental panel includes various grasses, weeds, and trees responsible for causing seasonal allergies. What Are the Types of Allergy Blood Tests? Blood tests used to test for allergies are called immunoassays, which come in three types: ELISA, FEIA, and RAST. Occasionally, other blood tests, such as a complete blood count (CBC) or while blood cells differential might indicate the presence of allergies, though they are not conclusive. Regardless of the type of blood tests, they are performed the same way in the blood-collection facility: by withdrawing blood from a vein in the arm. How Are the Allergy Blood Tests Interpreted? The confirmation of allergies is done based on three factors: medical history, physical examination and symptoms, and allergy test results. 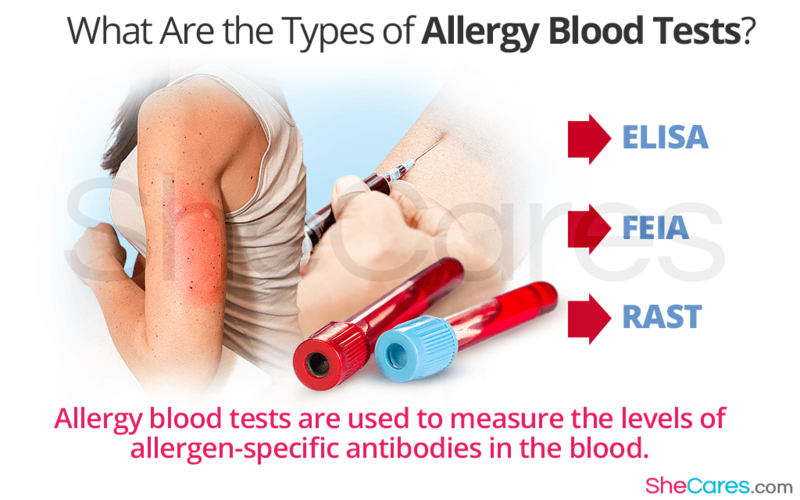 Allergy blood results typically give a total IgE level, as well as a list of tested allergens, indicating which of them are associated with increased IgE. High level of IgE is generally a good indication of allergies. However, certain medical conditions, such as a parasitic infection, can also increase the antibody levels. Also, a woman who has outgrown an allergy might continue having increased IgE for many years. Moreover, allergy blood tests often give false results, so they have to be interpreted by a certified allergist or immunologist. Are Allergy Blood Tests Expensive? Blood allergy tests are generally the most expensive of all available allergy tests, such as skin or challenge tests. Some insurance plans do not cover their cost. The out-of-pocket expense depends on many factors, such as the number of tested allergens, and it can range from $ 200 - 1,000. Sometimes a doctor can order a blood test only for specific allergens, suspected of causing an allergy, which might be helpful in lowering the overall cost. Allergies are difficult to diagnose, particularly because there is such an abundance of possible allergens. Besides blood tests, two other types of allergy tests are also used to aid the diagnosis: skin tests and challenge tests. Although a skin test is the cheapest and preferred method, it is not suitable for all women for a number of reasons. Your doctor will be able to tell you which allergy tests are appropriate for you.